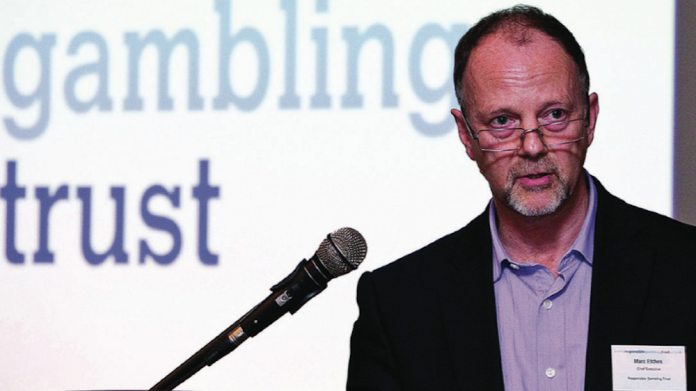 Speaking to Coinslot, CEO of GambleAware Marc Etches explains how much more money the industry will need to provide beyond the two years set out by the charity’s Strategic Delivery Plan. COINSLOT: You’ve doubled your annual spending, but you are not asking the industry for more money this time because it’s coming from bad behaviour. I suppose the question is, next time, when you can’t rely on bad behaviour, is the industry going to be asked for more money? Marc Etches, CEO of GambleAware: So just to be clear, we set out this two year plan overall with an expenditure of £32m. In order to fund that last year we received voluntary settlement money of just over £5m,and then we are still targeting for the current year, and next year, a minimum donation of £10m from the industry. So the money that we already have from voluntary settlements,and the minimum £10m from this year would be sufficient, along with the cash that we already have, to meet that £32m. Our minimum donation isn’t rising, but I don’t expect the bad behavior to finish. We’ve already received more voluntary settlements, as was shown in our recent publication. However, we can’t rely upon that, that, that’s not predictable. So I am focussing on our target for minimum donations and if we receive more voluntary settlement money we will seek to expand our spending.But you are right to say that if we are beyond year three, in other words after this two year plan, and if we are to continue the level of expenditure, then yes indeed, the expectation of the industry will be that they need to provide more – effectively 50 percent more. But that’s two years away,and I think there’s lots of discussion to be had about whether there ought to be a statutory levy. Our trustees are very clear that they think they should be, we recognise that the government at this time say no, but there ought to be a statutory levy. I think we’ve made it clear in the Strategic Delivery Plan that it’s not our expectation that GambleAware receives all moneys in relation to the industry donating to research, education and treatment. And indeed, if there were a statutory levy we wouldn’t assume that that would come to us in its entirety. We would,this time, just be very pleased to be able to distribute £16m a year. We want to get that right,and do that as best we can, and if we are seen to be doing good things,then maybe we will be given more money,whether that be on a voluntary or statutory basis.We are not wanting it all,we are trying to set out very clearly what we want to do the next two years. I think everyone needs to recognise that everybody should up their game come year three. However, when you look at the gap between the number of problem gamblers that seek treatment services – that we provide services to – last year it was just short of 9000 people, which we estimate is just less than 2 percent if you look at the 430,000 problem gamblers that are said to be in Britain. If you compare that to the rule of thumb that’s used in relation to the population of alcohol dependant adults in Britain,the rule of thumb there is that probably,of the total number,maybe as much as 13-15 percent would be amenable to taking on treatment if it were available to them. And of course it is for alcohol – it’s available and paid for by the state – unlike the services that are provided by us,because the state currently doesn’t assume that responsibility.The gap, then, might be argued to be between 2 – 15 percent of that 430,000. CS: We’re talking about a statutory levy, yet recently you were talking about how the industry is making good progress with the voluntary levy, which suggests that a statutory levy is not needed, surely? ME: No,it’s all relative, isn’t it? So last year we asked for a minimum of £10m and the industry donated £9.4m. CS: Which is up by three times the amount on the first quarter of last year. ME: We’re making good progress towards making the £10m minimum this year,so that’s what I’m referring to about making good progress. I happen to think that, ultimately,if we are going to bridge that gap – nevermind what we have to do around education and indeed around research – then there is a need for a great deal more money than simply the money that we are asking for,and of course some public figures are talking about – nevermind 0.1 percent – but there are public figures talking about perhaps a statutory levy of 1 percent, which is £140m,in order to fund a whole a range of other activities across research education and treatment, so I’m talking in relative terms about the minimum target for this year. Do I think that we ought to have a statutory levy in order to more things – not necessarily just for GambleAware? Yes I do,and so do trustees. CS: So you’re saying perhaps 50 percent more in terms of how much the industry will have to pay, but at the same time it says in your Strategic Delivery Plan that a plausible sum would be in the range of £21.5m to £67m in terms of how much the industry should be raising per year for GambleAware. £67m is quite a lot more than 50 percent, isn’t it? ME: So again, let me just try and draw the distinction.I think the logic runs from our Strategic Delivery Plan, that if we are to continue the run rate ie. £16m a year, then what GambleAware would be expecting from the industry would indeed be an increase on the 0.1 percent – it would go to 0.15 percent. The reference you’re making,that we’ve alluded to, is indeed that RSGB and the Gambling Commission have tried to estimate the overall monies that might be needed for education and treatment,not just that which GambleAware requires.And indeed there are other figures. Lord Chadlington recently said 1 percent, which is about £140m. So the 50 percent is just for GambleAware, they are talking about the wider picture. We are just one small charity. If there were a £140m statutory levy,I would still be very pleased for GambleAware to have £16m of that, and for us to do what we are doing currently, and trying to do as well as we can,and if people felt that we deserve to have more, fine.The balance of £140m, if that is what it was,I would expect that to spend across a range of agencies. There are those that would suggest that GambleAware is seeking a monopoly on monies for education and treatment – we are not. CS: When you are asking for more money, yet the problem gambling rate has stayed relatively steady for the past decade now, how do you justify increasing your budget? It seems like rather than finding out how much it would cost to fix the problem, and then sending the industry the bill, you are just getting as much money as you can, and then figuring out where you can spend it after the fact. ME: It would be wrong to make that presumption. I think the fact we’re sending out this Strategic Delivery Plan rather demonstrates that.We have made it clear what we plan to do and the money we require to do it. I think if we break that down into the three areas of research, education and treatment, there is a very clear research strategy which the RGSB has established, that goes into quite some detail about the research it expects us to commission, and we’ve identified the cost of doing that. So I think we have got that the right way round. Just coming back to your question about the stability of problem gambling numbers,I think that’s open to question. And, indeed, the Gambling Commission uses a figure of 430,000 problem gamblers which I cite, which is significantly more than the 200,000 gamblers that was cited a few years ago. But we are much more interested in talking about the wider harms that arise from gambling, and that goes beyond simply talking about the number of problem gamblers.At least two million adults are at risk, so there are wider issues to take into account here.